Michael McFadyen's Scuba Diving - Kawanishi H8K1 "Emily" The Honiara area of the Solomon Islands has some very good diving, both on Guadalcanal itself and the nearby island groups. Across Iron Bottom Sound from Guadalcanal are the Florida Islands. First "discovered" by the Spaniard Mendana in 1568, they are more correctly known as the Nggela Islands. The group is made up of Nggela Sule, Nggela Pile, Buena Vista Island, Sandfly Island (wouldn't you love to visit there!) plus 50 smaller islands. Before World War II, the capital of the Solomon Islands was Tulagi (then more commonly called Tulaghi). This is a small island but ideally located with a protected harbour. One of the smaller islands in the Floridas is Ghavutu Island, about four kilometres east of Tulagi. Ghavutu is about 500 metres long and 250 metres wide. Before the war, Ghavutu was the base of Lever Brothers. They operated extensive coconut plantations in the Tulagi/Guadalcanal area. They had substantial infrastructure on the island, including docks and buildings. On 3 May 1942 Japanese troops took Tulagi and seized control of all the adjacent areas. On the north-eastern corner of the island there was a substantial concrete wharf constructed by Lever Brothers or the Japanese (it is not clear who built it but it was there in early August 1942). As well, there were seaplane slips located to the east of the wharf (past the small inlet if you are standing on the wharf looking east). There are bits still visible today). Ghavutu was connected to the west to Tanambogo Island by a 300 metre small concrete causeway. Tanambogo Island is even smaller than Ghavutu, only 300 metres by 75 metres or so. North of the two islands is another even smaller island. In between the smallest island and the other two islands, Japanese seaplanes were moored. When the US invaded on 7 August 1942, there were 13 sea planes based at Ghavutu Island. Soon after invading the Tulagi area, the Japanese commander began building an airfield on Guadalcanal. This was planned to be finished on 15 August 1942. This would enable Japan to have large bombers within range of Australia and other countries like New Caledonia and new Hebrides (now Vanuatu). The US decided to invade the Solomons, hopefully before the airfield was completed. On 7 August 1942, the first day of the invasion (the Battle of Guadalcanal), Ghavutu was to be invaded in conjunction with the invasion of Guadalcanal itself and nearby Tulagi. At 1145 on that day, Douglas Dauntless SBD dive bombers attacked Ghavutu for 10 minutes and then the Tulagi Fire Support Group (a cruiser and two destroyers but I am not sure what the ships were) bombarded the island for five minutes while the 1st Parachute Battalion (acting as infantry) approached the island in landing craft. At 1200, the parachutists landed on the island in the area of the slips. The first wave reached shore but the next groups were hit hard by the Japanese. It is reported that one in ten were hit. Within two hours the Americans were approaching the island's lone hill, still under heavy fire. The Japanese were entrenched on the island in caves and bunkers (you can see some of these today as you walk up the track to the top of the hill). They were also firing from Tanambogo Island. 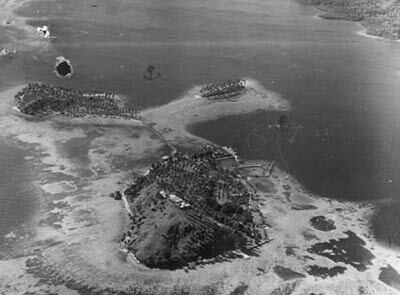 An aerial photograph of Ghavutu Island in 1940. The wharf is located top right of island. Tanambogo Island is top left. An aerial photograph of Tanambogo Island under attack. By 1800 the Americans had captured the hill. By the next day, the island was totally in American hands, with the 1st Parachute Battalion now supported by two companies of the 2nd Marines. It is reported that the parachutists and marines suffered when they were shelled and bombed by their own forces. As mentioned above, Ghavutu Island was connected to the adjacent island Tanambogo by a causeway and the fight for that island was carried out at the same time. On 7 August 1942 B Company of the 2nd Marines attempted to invade the island after a short aerial and water based bombardment but this failed. At 1130 on 8 August 1942, the 3rd Battalion of the 2nd Marines and two light tanks attacked Tanambogo from the beach and causeway. By late afternoon most of the island had been captured. It is reported that by dusk all the Japanese on the island were dead. 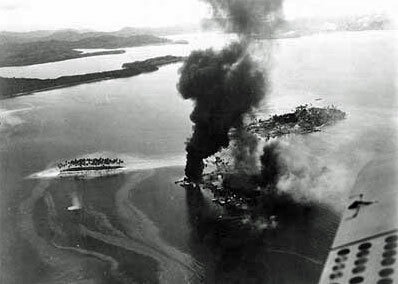 During the attacks on the two islands, 108 marines were killed or missing and 140 injured, quite a heavy toll when the size of the islands is considered. Marines estimated that they had fought 1000 Japanese but the real figure was about 500. 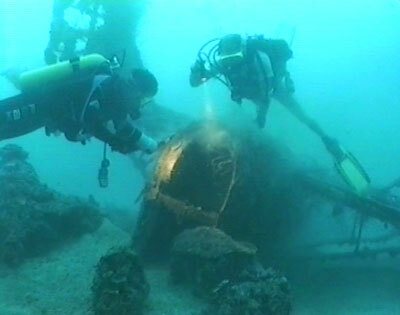 During the attack, the Japanese flying boat tender Akitsushima was seen in the area on its way to Gizo where it was going to establish a sea plane base. Just over a year later on 17 February 1944 the Akitsushima was in Chuuk Lagoon and damaged during the first raids by the American aircraft. It escaped through the South Pass and lived for another day. 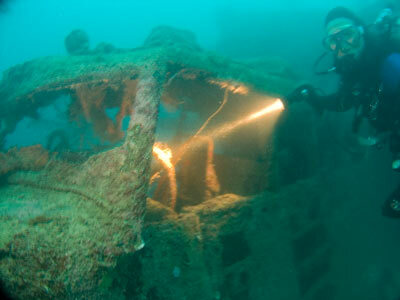 It was also in Palau just prior to the attacks by the Americans on 30 and 31 March 1944. 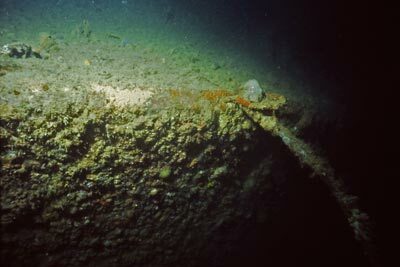 The Akitsushima was finally sunk by the Americans on 24 September 1944 at Coron in the Philippines. The Americans used Ghavutu as a patrol boat base. There was also an observation post on the top of the island, togther with a large gun, some concrete water tanks (built by US SeaBee's unit CB26 on 9 April 1943) and a flagpole. The men who worked there lived on Tanambogo and went across to Ghavutu each time they were on duty. Apparently the Americans still believed that there were Japanese on Ghavutu even months after they had taken the island. This was probably not true, the island is not that big, but they reported that it made them jittery when they were on night shifts. During the War, the Royal New Zealand Air Force (RNZAF) had a squadron of Consolidated Vultee Model 28 PBY Catalina flying boats based in the Solomon Islands. I am not sure where they were based, but it is possible that the RNZAF were based at some time at Ghavutu, utilising the Japanese seaplane slips. I base this guess on the fact that I found some 1939 NZ beer bottles under the Ghavutu Island Wharf. It is also possible (probable) that the US based Catalinas here as well. In 1992, 2001 and 2009 I visited Ghavutu Island. On both trips I did two dives in the area. The diving here represents both phases of the occupation of the islands. One of these dives on each trip was off the Ghavutu Wharf and the other was on Japanese "Mavis" flying boats. In 1992 our dive was to be on a Japanese "Emily" flying boat (at least this is what we were told at the time) which was located in the small bay to the north of Tanambogo Island. 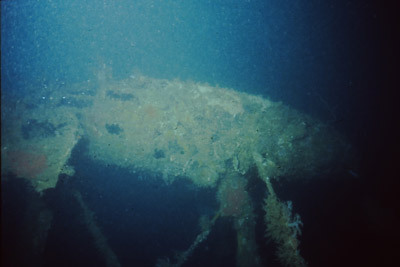 The plane was allegedly one of four or five sunk at their moorings by US aircraft, presumably on 7 August 1942 by the Douglas Dauntless dive bombers. The other planes had at that time not been located. The Kawanishi H8K1 "Emily" flying boat is universally recognised as the finest flying boat of World War II. The plane was huge with a wingspan of almost 125 feet and a length of over 92 feet. The "Emily" was powered by four 1,825 hp Mitsubishi Kasei 14 cylinder radial engines and was mostly used for bombing and reconnaissance purposes and sometimes transport. Compare those dimensions and power plants to the British Short Sunderland flying boat (similar to the Qantas Sandringham in Port Vila Harbour) and the Boeing B-17E Flying Fortress (north-west of Honiara) which had wingspans of almost 115 feet and over 103 feet respectively. Both were powered by four 1,200 hp engines. (Note: The Japanese designation H8K1 means H=Flying Boat, 8=8th in the flying boat series, K=Kawanishi and 1=model). In late July 1942, Kawanishi H8K1 Emilys were responsible for three attacks on Townsville in Queensland. On the night of 25/26 July two Emilys bombed Townsville port but the bombs fell wide of the mark and landed on mudflats. The planes, W-45 and W-46, were not intercepted and no anti-aircraft guns fired on them. On 27 July one Emily was attacked a it flew over Townsville and it dropped seven of its eight bombs on the Many Peaks Range. This aircraft was W-46. The third and last raid was on the night of 27-28 July when two Emilys (W-37 and W-47) left their base (I am not sure where this was yet) but W-37 had engine problems and turned around. The remaining plane continued and was attacked by Bell P-38 Aerocobras between Magnetic Island and the mainland. The Japanese plane dropped its bombs and they hit the mud below (one remained in the plane). During the attack by two Aerocobras, the bomb fell out of the bomb bay and hit the ground destroying a palm tree. Cannon fire from the fighters exploded in the rear gunner's compartment. The planes continued their attack until they ran out of ammunition. The Emily made it safely back to base. During research to update these web pages, I corresponded with Raymond Holyoak (who was writing his thesis on the defence of Townsville during WWII) by email about the Solomon Island wrecks and provided him with copies of some photographs I took on my 1992 trip. Mr Holyoak advised me (and this confirmed something that I had suspected) that the plane at Ghavutu is in fact, not an Emily. Mr Holyoak told me that from the shape of the exterior photograph of the cockpit (see the photo next to the Kawanishi H6K5 Mavis - No 1 paragragh below), the aircraft at Ghavutu is definitely a Kawanishi H6K (codenamed "Mavis" by the Allies). The front window shape is definitely different to that of the H8K Emily. Both the Emily and the Mavis were four engined, the Emily mainly being used for bombing and the Mavis for recon (there are some other main differences that confirmed this - I will detail later). There is, however, an Emily to be dived in the Pacific. This is located at Chuuk Lagoon. See the separate article on that wreck. Kawanishi Kokuki Kabushiki Kaisha (The Kawanishi Aircraft Company Limited) was established in November 1928 with its factory being located at Naruo Mukogun Hyogoken near Kobe. During the war it built four types of sea planes, two very large planes and two small fighters. It also built a land based derivative of one of the fighters. As well as the Emily detailed above, Kawanishi designed and built the Kawanishi H6K Mavis, Japanese designation Type 97 Flying boat, model 23. In early 1933 the Japanese Navy issued a specification for a new flying boat to Kawanishi and they put up two prototypes. One was a four-engined Type Q and the other a three-engined Type R. Both monoplanes, the Navy was not satisfied with either proposal. In early 1934 the Navy revised its specifications seeking a four-engined machine with performance superior to the Sikorsky S-42 (a range of 2,500 nautical miles at a cruising speed of 120 knots). Led by Yoshio Hashiguchi and Shizuo Kikahura, Kawanishi designed a flying boat with a parasol wing mounted above the hull on inverted V struts and braced by parallel struts mounted low on the hull. It also had two floats under the wings and twin vertical tail surfaces (although I have seen photos of one with three tails). It was given the designation Type S and was powered by four Nakajima Hikari 2 nine-cylinder air-cooled radials of 840 hp output driving three-bladed propellers. It made its maiden flight on 14 July 1936 with Katsuji Kondo as pilot. Some minor modifications were made after this first flight to improve its characteristics on water. The manufacturer's trials went smoothly and the prototype was formally handed over to the Japanese Navy on 25 July 1936. The prototype was underpowered but it was the first Japanese aircraft of either service to have a power-operated dorsal turret. There were three 7.7mm machine guns, one an open nose position, one in the dorsal turret and one in the tail. It carried either two 1,764 lb. torpedoes or a maximum load of 2,205 lb. of bombs attached to the wing support struts. Another two prototypes were delivered in 1937 and one more in early 1938. These differed from the first prototype in having longer ailerons, enlarged tail fins and a redesigned dorsal turret. The Mavis had a wingspan of 131 feet (40 metres) and a length of 84 feet (25.6 metres). That is, it had a greater wingspan than the Sandringham, the Flying Fortress and the Emily but it was really smaller than all of them (as I will explain below). (Note: The Japanese designation H6K5 means H=Flying Boat, 6=6th in the flying boat series, K=Kawanishi and 5=model). Service trials being complete, the first, third and fourth prototypes were re-engined with 1,000-hp Mitsubishi Kinsei 43 fourteen-cylinder radials (three-bladed propellers were retained on all versions), and these became the first to enter service with the Japanese Navy as the Navy Type 97 Flying Boat Model 1, or H6K1. The next production variant was the H6K2 of which 10 were built. Aside from minor internal changes, they were identical to the re-engined H6K1s. The seventh and eighth H6K2s were converted into staff transports with the designation H6K3. Although there was a need for a military and a civil transport version, the Navy decided to continue with the basic maritime reconnaissance variant. The next version, the H6K4, or Navy Type 97 Flying Boat Model 22, became the major production type. The H6K4 had fuel capacity increased from 1,708 gallons to 2,950 gallons. To lighten and simplify the aircraft, the dorsal turret was replaced by two beam "blisters" similar to those on the Consolidated Catalina each with a single 7.7mm machine gun. Two other hand-held guns of this calibre were housed in the nose position and in an open dorsal position and in the tail was a hand-held 20mm cannon. Later H6K4s were re-engined with Kinsei 46s but they were still called H6K4. There were 127 H6K4s were built between 1939 and 1942, with 66 in use at the beginning of the Pacific War. Besides performing their primary duty of maritime patrol, H6K4s were also used as bombers in the Dutch East Indies and at Rabaul, New Britain. But the Mavis, as the Allies code-named her, was far too vulnerable to ground fire and interceptors due to her lacking armor and self-sealing fuel tanks. It was withdrawn from bombing missions as soon as possible once sufficient numbers of land-based Mitsubishi G4M Bettys were available to replace it. It was still valuable in the maritime recon role and its superb range made the Mavis very suited to patrolling the Pacific. As indicated above, all planes after the 114th H6K4 were built with four 1,300-hp Kinsei 53 radials as "insurance" in case the new Kawanishi H8K1 Emily was delayed in production. It also had the open nose gun replaced with turret. This aircraft served as the prototype for the next version H6K5 Model 23. Some of the H6K5s were powered by the Kinsei 51 which differed only in minor details from the Kinsei 53. After 36 were completed, production of the basic H6K maritime recon version ended in favor of the H8K. As more H8Ks came into use, remaining H6K4s and 5s were withdrawn from normal service and fitted with bench seats converting them into troop transports. Purpose-built transport versions of the Mavis were also built. The first two were H6K3s and once production of the H6K4 was underway, Kawanishi began making a small number of transport versions both for the Navy and for Greater Japan Air Lines (Dai Nippon Koku K.K.). These were designated H6K2-L or Navy Type 97 Transport Flying Boat. Despite the version being H6K2-L, they were actually based on the H6K4. Modifications made including the deletion of all armament, the installation of a mail and cargo compartment forward of the cockpit, a galley behind the cockpit and a midship cabin with eight seats or sleeping accommodation for four. Next there was a passenger cabin with seating for 10 (but no sleeping accommodation), a toilet and finally another cargo compartment. There were 16 Kinsei 43-powered H6K2-Ls. After this, 20 Kinsei 46-powered H6K4-Ls (with extra windows along the sides of the passenger cabins) were built and two patrol fyling boats were converted to H6K4-L.
Of the transports (called code-named Tillie by the Allies), 20 were used by the Navy as transports and the Ocean Division of Greater Japan Air Lines used the other eighteen to serve Yokohama-Saipan-Palau-Timor, Saipan-Truk-Ponape-Jaluit and Saigon to Bangkok. Several of these planes were intercepted and destroyed by the Allies, but the survivours remained in service until the end of World War II. A total of 215 Mavis and Tillie variants were built, production ending in 1943. One flexible 7.7mm machine gun in open bow position, one flexible 7.7mm gun in a powered dorsal turret, and one hand-held 7.7mm gun in tail position; two 1,764-lb. torpedoes or up to 2,205 lb. bombload carried externally. One 7.7mm gun in either open bow position (4) or bow turret (5), one 7.7mm gun in open dorsal position, one 7.7mm gun in each beam blister, and one hand-held 20mm cannon in tail position; two 1,764-lb. torpedoes or up to 2,205 lb. bombload carried externally. As mentioned above, the Mavis differed from the Emily in that it was a parasol strut-braced wing (the wing was one piece and was elevated over the hull on struts) while the Emily had a wing connected directly to the top of the fuselage. In some ways, the Mavis looked a little like a Consolidated Vultee PBY-5 "Catalina" from the side but it was much larger while the Emily looked like a Sunderland/Sandringham. I have also read that the Mavis was originally designed as a civil flying boat so it was set up for carrying passengers (up to 20) but in war duties it carried a crew of 10. The plane's fuselage was not that big, so it was not a huge plane in overall terms. It was generally used for reconnaissance purposes. Some Mavis planes were used for recon over Townsville for the attacks detailed earlier in this article. 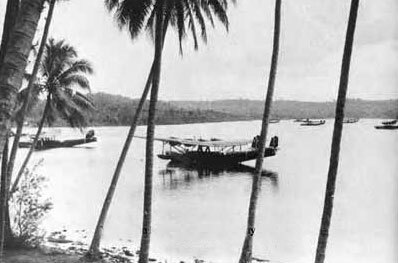 As mentioned above, north of Tanambogo Island and between that island and a smaller island to the east, there was a Japanese seaplane base. I now know that on 7 August 1943 there were at least 7 large seaplanes, probably all Kawanishi Mavis aircraft, moored here. There were also reportedly a few more to the east of the small island. The US planes supporting the landings strafed the seaplanes or bombed them, causing all to sink. These planes are probably H6K5 but may be H6K4. 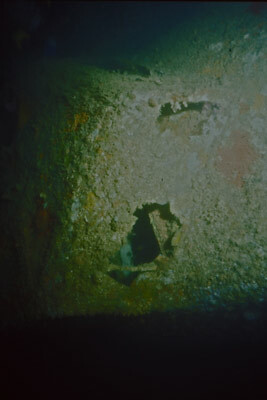 Nowadays there are between 10 and 13 wrecks of this model plane that can be dived here (advice by dive operator in October 2002), although not all may be complete or nearly complete machines. 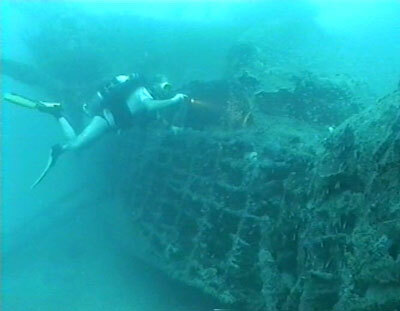 On 11 August 1992 I dived a Mavis that sat on the bottom at 42 metres with its wing broken off. The fuselage is lying on its starboard side and it is pretty well intact. 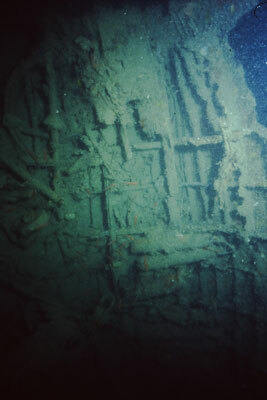 The struts that originally held the wing in place are still partially connected and form a "spider web" entanglement. This was what made me suspect that the plane was a Mavis rather than an Emily as the latter did not have any supporting struts or wires but the wreck has a whole series of metalwork that held the wing in place. From the tip of its nose to the tail, things to see include the cockpit, inside the fuselage, the wings and floats. There are also scattered bits and pieces like ammunition canisters. The visibility on this dive is not real good, probably only two to three metres. A lot of very fine silt covers the plane and it is very easily stirred up whereupon it can virtually totally block out all visibility. Extremely good buoyancy is required on this dive. When I dived it the viz was about two metres. Hence my problems in identifying the plane. NOTE: above photos scanned 2011 from slides taken in 1992 with Nikonos IV-A. 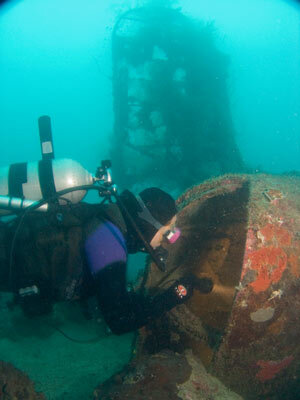 In October 2001 and September 2009 I again visited the Tulagi/Ghavutu area and dived on another Mavis. This is almost fully intact and is said to be the best of the ones found so far. The plane sits at just over 30 metres on a sandy (rather than silt) bottom. Its location is GPS S9° 6' 31.9" E160° 11' 9.6" using WGS84 as a datum. Facing south-west, the plane has a mooring attached to its own nose mooring ring. The nose is broken just in front of the cockpit and is bent up a bit. You can see where the nose gunner/camera operator sat right at the front. There was a recon camera sitting behind this spot but in 2009 it was back in front of the cockpit windscreen. 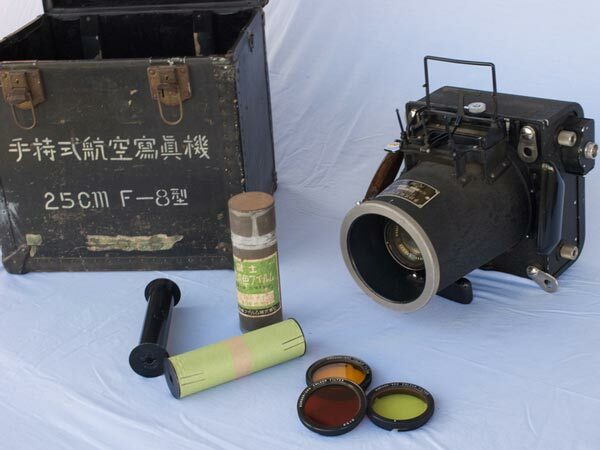 This camera is a Japanese Navy Handheld Aerial Camera, in fact, it appears to be a Rokuoh-Sha F-8 with Hexar 25cm f/4.5 manufactured by Rokuoh-Sha Showa 16-3. You can look into the cockpit, seeing the seats and controls as well as instruments (all obviously unreadable due to water impact). There is also a thermos, with the outer metal casing almost gone, the outer glass case broken in spots and the inner glass case intact. It is really too small to get inside the plane. Behind the right hand pilot's seat there is a hinged window that opens up. Behind this there is what appears to be the navigator or engineer's seat. On the rear wall there are numerous gauges and some control levers, perhaps for the engines. Above and behind the right hand pilot's seat there is a navigator's bubble. Back under the wings there are some funny looking compartments that I could not ascertain the use for. The fuselage is broken here, with the rear section fallen over to the starboard side a bit. Further along the fuselage there are gun/observation windows on both sides. Above this there is a glass plate aerial camera and also two glass photographic plates. There are also some more inside the plane. The plane has two tail fins. A large area of the fins and the tail were fabric covered so these are now just metal frames. The tail gunner's spot is easily visible, but there is no gun. The "door" still moves. Returning forward, you come to the wing. As mentioned earlier, the wing sits well clear of the fuselage on struts. The port wing is almost 100% intact. The very tip of the wing is broken, but both engines are intact. The port float is still in place under the outer engine. This wing touches the reef as the bottom is a bit higher on this side. The starboard wing is a different matter. In 2001, as far as the inner engine the wing was intact and the inner engine was there in its correct place. At that time, the wing stopped past this engine. It appears that the plane may have been hit in the outer engine area and the wing broken off here. 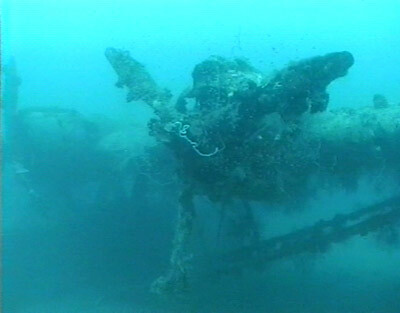 The engine is nowhere to be seen, although the props and hub lie on the sand straight under the engine's original location. However, in 2009, the wing was broken before the inner engine. This engine now hangs down below where it was in 2001. 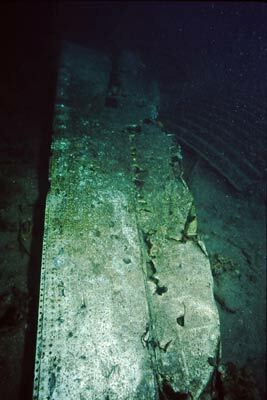 The starboard float is also missing as one would expect and the remaining section of wing lies only a few metres away (perhaps the engine is under it). Therefore, it is likely that the plane was bombed or hit by bullets in the outer starboard engine, causing the engine to break free of the plane. This would cause the float to collapse and the plane would then tip over on its starboard side and more than likely, take in water and sink. This is a lovely plane to dive on, very interesting indeed. 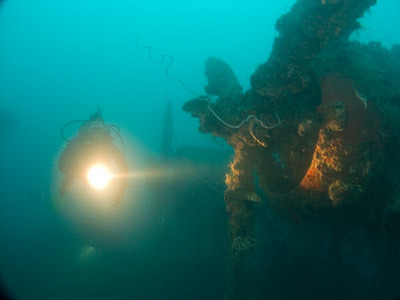 Visibility is much better, at least 15 metres and the depth of 30 metres means a good period can be spent on it without going into decompression. You can dive these planes with Tulagi Dive. See my Tulagi page for more information.